I'm working on a Swiss army knife utility to do translations, and my first test subject is Metal Slader Glory DX. The game is complicated so it was an obvious first choice. My goal is to have this game translated but to also have my utility undergo a stress test. Here's a screenshot of my script management utility. You can search by menu name, script body text, and comments. It even includes a spellchecker. Here's what's done on the technical side. The entire script and dictionary has been dumped and can be inserted. It is all managed in XML. The script dumper is simple to use and only requires one click of a BAT file. Once it has finished dumping you can load it into the script manager. When you want to insert the translation, you click another BAT file, and your text is inserted. All the script insertion and dumping data is in an XML file, so you don't need any technical expertise to translate. I created an advanced utility that manages the original dialogue and translation. You have then side-by-side comparison. I have a preview window so you can see how it looks like in-game. 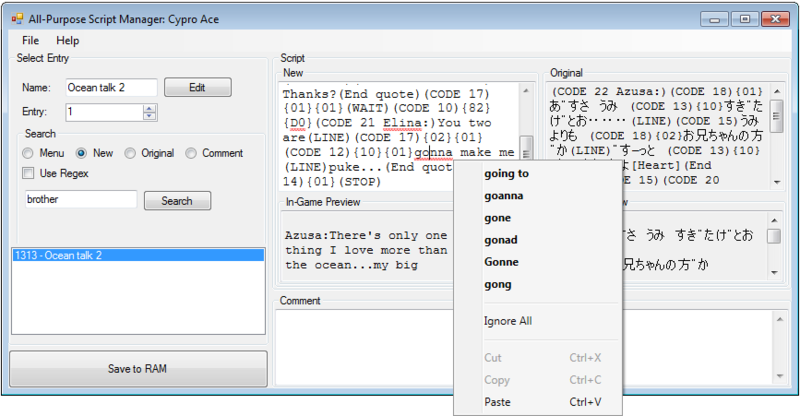 It removes all the action commands so you can focus on translating the dialogue. I decided not to code a bitmap display. Games are very different in how they draw. There's tons of free space, so there's no concern about expanding the ROM. Text indenting needs to be removed. The indenting takes up a lot of screen space. The debug mode to be enabled. 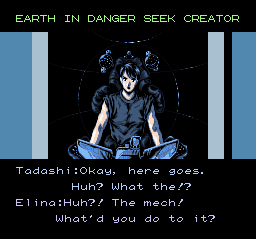 The debug password is the same as the NES original, but it redirects to first chapter instead of the debug mode. Judging by the script dump, the debug mode is far more advanced, with graphic previews and flag modifiers. The game has two identical character graphical tables. One is in 2BPP and one appears to be decompressed in memory as 4BPP for the password screen only. I either need someone to load the 2BPP instead, or reverse engineering the compression. I can handling coding the reinsertion. Additionally, I have some dissemblies I can provide to you for the dialogue engine. I need someone or a group of people to translate the entire game. Basically, I need hacking help (especially the first option) before the translation even starts. If no one offers a helping hand, I'll release the utilities to the public prematurely. Hopefully someone will find the utility useful for translating. At the moment, I'm not interested in doing the SNES version and probably won't be for several more years. I don't have the time to hack and translate the game the way that I would want to. I'm not even sure if most of the NES script can be reused because I'm sure Yoshimiru made revisions to his script and IIRC the SNES script is twice the size of the NES script. It is not an easy undertaking to say the least. In cases like this it'd be wise to use something like OmegaT and have the original NES script as a translation memory file. When properly used, the program can automatically handle identical matches (as well as duplicates) and help deal with fuzzy matches significantly quicker as well. It does far more than that, of course. While there is a learning curve, I personally can't see myself going back to a simple text editor or spreadsheet program for my translation purposes, even for smaller projects. Thanks for the suggestions. However, I created a utility to spot lines I can reuse. However, I contacted Pennywise's translator and got no response. I contacted Her-Saki, and got a reply a few days ago. 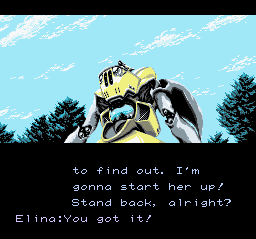 They're interested; they worked on an NES translation as well. As for the hacking. It's all done... except for the VWF, which is beyond my skills; I learned ASM shortly after making this post. There's a lot of VRAM to work with so it's doable. Justin3009 might help me out here. tl;dr I did all the hacking and got a translator. Other than VWF hacking, no further assistance is needed. Can this tool be used on Gameboy color games?